Create a circle about 12-15 yards with players spread around the outside of the circle evenly. Half of the players on the outside need a ball where the other half do not. Two players step into the middle of the circle. One of the two players should be designated as the attacker, and the other player will defend that player. 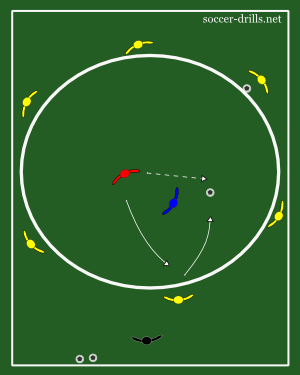 The attacker should ask for a pass from one of the outside players with the ball. The attacker should receive the ball into space avoiding the defender, and pass to a different outside player who doesn't already have a ball. The defender should attempt to win the ball from the attacker. The attacker should play for 1 minute, then rotate the attackers and defenders. Turn the foot sideways where the ball is struck with the inside of the foot between the big toe and the heel. Strike the middle of the ball; make the ball have a straight top spin towards the target.